Can lowering your cholesterol really be as easy as putting one foot in front of the other? If you can drag yourself off the couch or away from your computer for just 30 minutes a day of brisk walking, you can lower your cholesterol. Can lowering your cholesterol really be as easy as putting one foot in front of the other? If you can drag yourself off the couch or away from your computer for just 30 minutes a day of brisk walking, you can significantly lower your cholesterol, a new study shows. No drugs are needed and you can see the results in as little as three weeks’ time! Swedish researchers recently tested the effects of a single daily 30-minute bout of brisk walking. They performed a randomized, placebo-controlled study in a group of healthy adults aged 25-45 years. The investigators wanted to see if 30 minutes of daily walking at a moderate intensity for three weeks was enough to lower the subjects risk for heart disease by reducing their cholesterol. The 33 subjects were divided into two groups. The first group was asked to walk briskly for 30 minutes every day for three weeks. 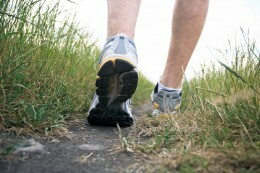 On each daily walk, the participants averaged about 3600 steps and burned about 190 calories. The second group did not do any exercise during the three-week period. At the end of the three weeks, the subjects in the walking program experienced significant drops in their total and LDL cholesterol levels, while the control group did not. They also lost weight and improved their body mass index (BMI). This was not the first study to show the benefits of walking on cholesterol. 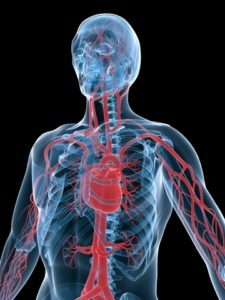 A study in English men with high cholesterol, for instance, found that brisk (moderate intensity) walking for 12 weeks improved HDL levels and significantly lowered the ratio of total cholesterol to HDL, which in turn lowered the mens’ risk of developing coronary heart disease. The more often you walk, the faster you walk, and the further you go have all been shown to make a difference when it comes to the likelihood that you’ll have high cholesterol. Take speed, for example: compared with men who walk slowly (at a speed of less than 2.7 miles per hour), those who walk briskly (at least 4.6 miles per hour) have a 53% lower chance of being prescribed a cholesterol-lowering medication. This same speed (4.6 miles per hour) has been associated in other studies with significant increases in HDL, the “good” cholesterol. No matter what your walking speed, distance, or total time, however, the benefits are clear. For most of us, walking is an inexpensive, easy, and convenient form of physical activity that can help lower our cholesterol as well as provide a myriad of other benefits. So put on your walking shoes, shoot for 30 minutes of brisk walking, and get your cholesterol under control the drug-free way! Pagels P, Raustorp A, Archer T, Lidman U, Alricsson M. Influence of moderate, daily physical activity on body composition and blood lipid profile in Swedish adults. J Phys Act Health. 2012 Aug;9(6):867-74. PubMed PMID: 22898465. Coghill N, Cooper AR. The effect of a home-based walking program on risk factors for coronary heart disease in hypercholesterolaemic men. A randomized controlled trial. Prev Med. 2008 Jun;46(6):545-51. Epub 2008 Jan 16. PubMed PMID: 18316115. Williams PT. Reduced diabetic, hypertensive, and cholesterol medication use with walking. Med Sci Sports Exerc. 2008 Mar;40(3):433-43. PubMed PMID: 18379204. Bemelmans RH, Blommaert PP, Wassink AM, et al. The relationship between walking speed and changes in cardiovascular risk factors during a 12-day walking tour to Santiago de Compostela: a cohort study. BMJ Open. 2012 May 11;2(3). bmi, body mass index, calories, cardiovascular, cardiovascular risk, cardiovascular risk factors, cholesterol, cholesterol levels, cholesterol lowering, cholesterol lowering medication, coronary, coronary heart disease, diabetic, exercise, good cholesterol, hdl, hdl levels, health, heart disease, high cholesterol, ldl, ldl cholesterol, ldl cholesterol levels, lipid profile, lower your cholesterol, lowering your cholesterol, physical activity, total cholesterol.